I tried something new over the past week, i spent sometime glossing over a relationship book, a genre you'd never catch reading until now. I've always had the belief that most of the things found in many of such books seldom have real world use. 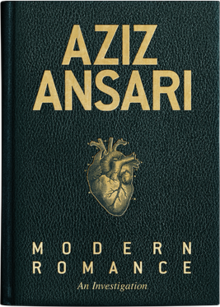 I only read the book because of the author Aziz Ansari who also happens to be the main character of Master of None; you can find it on Netflix, do check out Episodes 101, 105, 106, 201, 204, 208, 209. One of the things about the book that struck me about the book was the acknowledgement of the author(s) that they (or the book) did not hold the key to unlocking relationship Nirvana. Rather they touch on various aspects of modern day romance and comparing it with what was obtainable in the past; highlighting the role of technology has played on dating. Aziz did something that I liked, he showed how dating evolved through the years from dating people your parents agreed upon, to dating people within close proximity, to classified ads in the newspapers, video ads, dating websites and apps. It showed these methods have changed the way people sought out their partners. No longer were people limited to dating people who lived as far as they could throw a stone, It was no longer uncommon to find people dating people who didn't live in the same city, heck you wouldn't be pressed to find people dating people who lived in another country. It also showed that while technology had helped to bridge between peeps waylaid by distance, it has also come at a cost. While it has given us more options that before, we haven't done that well in handling the constant streaming of options available within reach. It loved the use of anecdotes, the exploration of how people in other cultures sought after their partners, the challenges they faced. Overall I really enjoyed reading this and would absolutely recommend it to anyone thinking of getting into, already in one or just got out of one.